Warning! If you have a swarm of bees that are threatening the safety of you, your family or your neighbors, don’t hesitate – call your La Palma bee removal experts at Bee Busters! La Palma is an affluent small community that has consistently rated on the list of best places to live for communities under 50,000. One visiting here is struck by the small town vibe and friendly faces. Like most of the rest of the region, it is blessed with a great climate. It has a low crime rate, a great response time from the local police, and good schools and services. It also has a great response time for bee control, thanks to Bee Busters, Inc! Bees also enjoy the perks of living in this urban area, with well-tended flower gardens and plenty of walls and fences to live in. They’re probably less excited though that in La Palma, bee removal service is of such quality. Spotting bees around in an unusual location that lacks flowers or water can indicate a swarm or colony nearby. 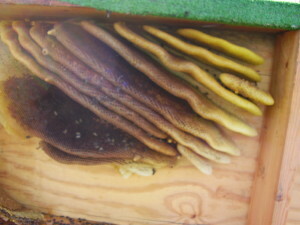 This colony most likely will be inside a hollow in a tree, wall, or other object, although sometimes you can see one form in the open. 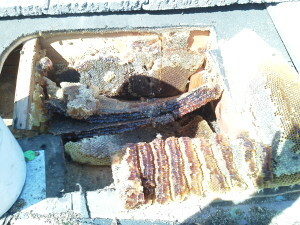 In La Palma bee removal advice and service is always just a phone call away. Bee Busters can tell you how to keep another swarm from being attracted to the same spot and identify locations that might also be homes to colonies. Bee Busters can remove your unwanted bee colony no matter how it is situated. Bee Busters, Inc. provides solutions in your community using tools and skills that are the most innovative in the country. Check out all of our services here. La Palma Bee Removal – We are professional beekeepers. We understand bees. We arrive ready to seek out and remove both the colony or swarm and the honeycombs they have created. Since all wild swarms now have Africanized Honeybees safety is a primary concern. We also guide the property owner to prevent future bee related issues. 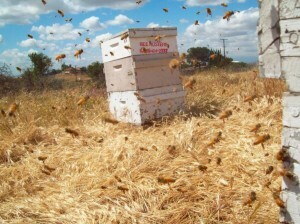 Bee Keeping – We offer beekeeping services. We do on site pollination, teach classes and schools about bees, and offer fresh local honey for sale. Additionally, we host classes and training for those interested in beekeeping. Keeping domestic bees is a great hobby for any age. If you want more information, please give us a call. As a La Palma bee removal company, Bee Buster, Inc. has been in business for more than 25 years. We do removal and keeping services for bees and stinging insects. Call 949-497-6264 for any problem of bee swarm or colony.